I am super excited because tomorrow I start teaching my nail art workshop to my students at my work. 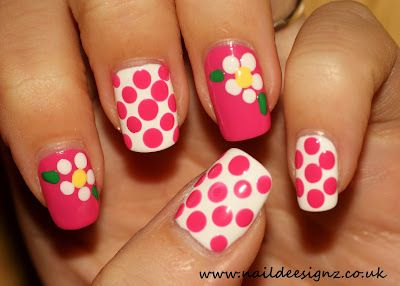 This is why I have created yet another nail art design this week. Not only did I want my nails to show the designs I will be teaching, my previous design got mega chipped and just looked awful. I did however get lots of compliments on my most recent design. 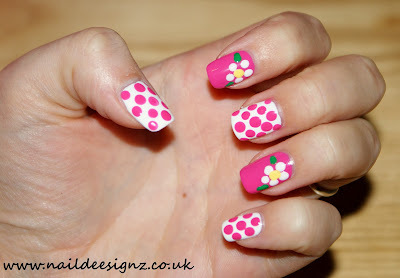 I love how simple this design is to do and it only requires a dotting tool. You can also use any colour variations. I didn't create a nail art tutorial for this because I created a flower and polka dot tutorial previously. Please see my tutorial page for these. To be honest, these are so easy to create they don't really require a tutorial. To create the leaves, simply take a small dotting tool dipped in green nail polish, create a dot and drag the dot outwards until you have a point.